Keira Knightley drew crowds of star-spotters yesterday, on location for her new movie in Clevedon, near Bristol. 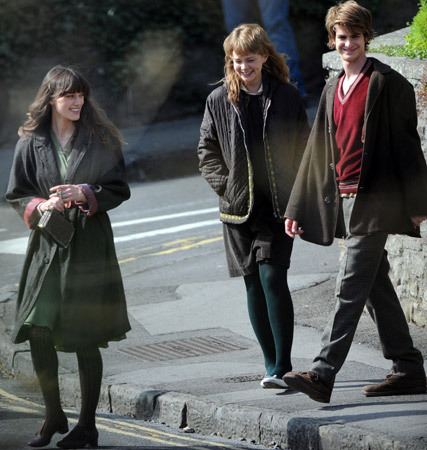 While we’re used to spotting the Brit beauty filming in voluminous period costumes and corsets, the new flick, Never Let Me Go, appears to be a far more laidback affair, and the actress hit the set in a khaki dress, covered up with a grey coat, patterned tights and purple flats. Although it may be a far cry from the glamazon looks we’re used to spotting on her, she still betrayed a hint of that star style, with her bang-on trend blunt fringe. Based on the novel by Kazuo Ishiguro, Never Let Me Go is based in a dystopian Britain, where humans are cloned to be organ donors. The film sees Keira playing Kathy H, whose story starts as a student at a boarding school, before following her character into adulthood. Keira reunites with Pride and Prejudice co-star Carey Mulligan for the film, which also stars Charlotte Rampling.